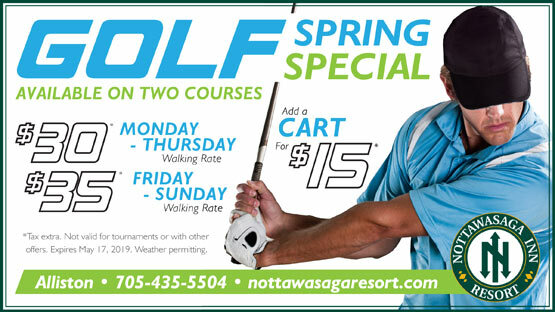 One of the few resorts in Canada offering 2 golf courses, choose between the Nottawasaga Course and the Ridge Course. Both courses feature expansive fairways and meticulously manicured greens that will tempt golfers time and time again. 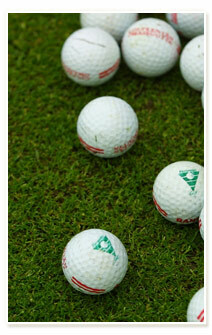 We are pleased to announce that the Driving Range is now open for the season. A bucket of balls is $6.00 and we have golf equipment for use at no charge for any of our guests who may not have their own clubs. We are pleased to announce that the Nottawasaga Course is now open, weather permitting. Call 705-435-5504 to book your tee times today! 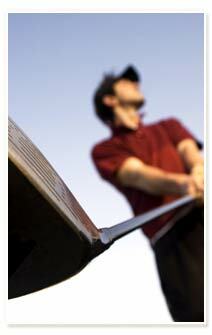 *Carts are mandatory on the Nottawasaga Course on Saturdays, Sundays and holidays and are included in the Green Fee. HST extra. **Twilight is determined seasonally and is considered to be: From the open of the season to May 10: 3:00pm. From May 11 to August 12: 3:30pm. From August 13 to September 9: 3:00pm. From September 10 to the end of season: 2:00pm. Trying out a new set of clubs, perfecting your shot or just warming up before your round, our full-size driving range at the Nottawasaga Courses are a great place to work out the kinks before hitting the course. Featuring top quality balls and open all season long, the Nottawasaga driving range offers 16 mat tee stations.